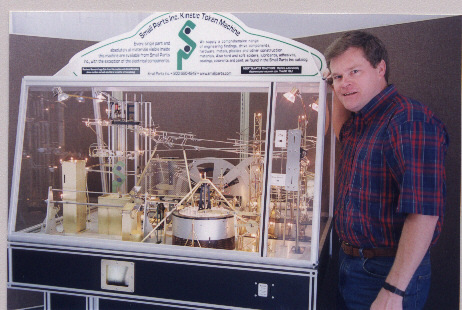 This page is for information about the Small Parts Inc. 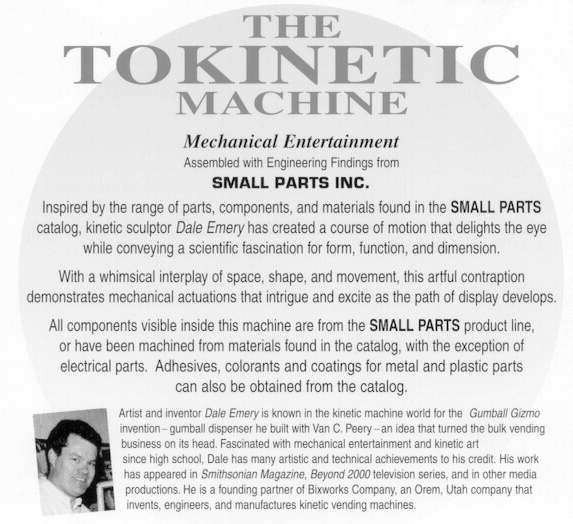 Kinetic Token Machine, (called the "Tokinetic" machine). 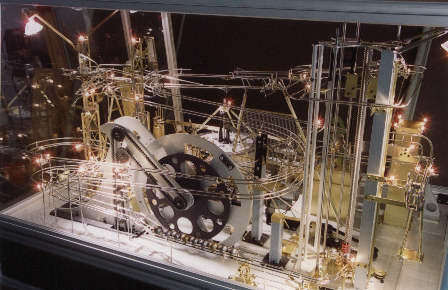 The TOKINETIC Machine has 15 motors, (many of which are controlled through H-bridge chips for stop/start/reverse action), 3 solenoids, 9 optical switches, and 17 mechanical switches. It uses an embedded microcontroller (Intel 8051 - series MCU) with shift register input and output extension (Motorola HC-series high-speed cmos logic shift registers). It dispenses a 1.125" souvenir token with S.P.I. information for catalog referrals, and accepts either US quarters or special tokens. 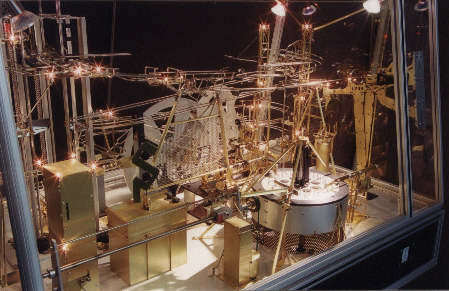 It runs a two-and-one-half-minute show, which features a rollingball sculpture that uses one-inch heavy balls of brass and steel, and one-inch lightweight balls of lucite, polyethylene, delrin, and aluminum. The balls share the same track and are kept separate via a spring-loaded trapdoor. Tracks and ramps include a folding segment which extends in time to provide a pathway for balls, as well as other elements which mechanically accommodate balls in a carefully programmed in-the-nick-of-time sequence. Among other elements is a robotic arm which picks and places the coin to actuate the fetch-and-drop souvenir token delivery. Initial public response has been along the lines of "You have to watch it a lot to see everything!" Children and adults alike are mesmerized, and technical-minded people seem to keep discovering aspects which elude the casual observer. Here are a couple views. Check the link above for more pics.